Nature Made’s Natural Vitamin E is recommended as part of a daily regimen for heart health, women’s and men’s health, longevity, prenatal care, memory, and fitness. Vitamin E is an antioxidant that fights against damaging natural substances known as free radicals. It is incorporated into the fat-based tissues of the body, such as the heart, fat-carrier molecules like LDL (“bad” cholesterol), and cell membranes–where it acts to stabilize these structures and protect them from free radical attack. Vitamin E also protects our cells from compounds such as lead, mercury, and other heavy metals. 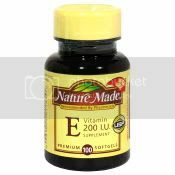 Vitamin E complements vitamin C in its function; therefore, it’s recommended to take the two vitamins together. There are several natural compounds, called tocopherols, that demonstrate vitamin E activity, but the natural form of vitamin E (d-Alpha Tocopherol) is the most common, potent, and easily-absorbed form. This natural vitamin E is the most active compound in terms of antioxidant activity. d-Alpha Tocopherol, Gelatin, Soybean Oil, Glycerin, Water, Mixed Tocopherol Concentrate. Take one or two softgels daily with a meal (or as recommended by your health care provider). Keep bottle tightly closed and store in a cool, dry place. Individuals taking blood-thinning medication such as warfarin should use caution in taking high doses of Vitamin E. Vitamin E supplementation should be stopped at least four weeks prior to surgery and may be resumed following recovery, as recommended by your physician. Vitamin E should not be taken in amounts higher than 1,000 IU per day. Keep out of reach of children. Do not use if imprinted seal under cap is broken or missing.